You aren't giving yourself enough credit. I think this looks fantastic! Wow. That frozen waterfall is just stunning! Well done indeed. I like it! 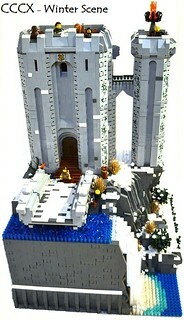 The bridge to the outer tower is a nice touch. 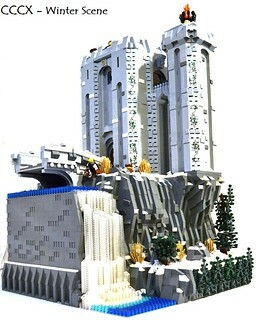 I like the height of the tower and the waterfall is excellent. The arches that go all the way up the sides look really good too. I feel like the over exposure of the pictures is washing out a lot of the detail to this build though. 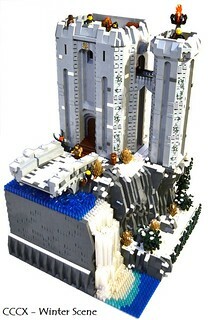 mrcp6d wrote: I like the height of the tower and the waterfall is excellent. The arches that go all the way up the sides look really good too. I feel like the over exposure of the pictures is washing out a lot of the detail to this build though. Completely agree! I had litterly 15 min to take and edit the pics.... The background detracted so much from the build that I had to whiten the background and there was a loss of detail. One of the things not easily seeen is that I used hundreds of white flower petals as snow. I will post high rez un altered pics and you should be able to see everything then. Honestly this was a last min effort and im I am suprised I even got it done. I have never worked so hard in so short a time to get a build done! This is incredible! I think you should be giving yourself a bit more credit, this build is something to be proud of. Well done! I think the waterfall is stunning, and I really like the section of rock-face that juts out making it the foundation of the beacon and the patches of snow everywhere.